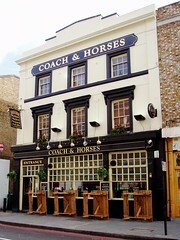 A good, friendly pub in Stoke Newington on the High Street. Inside the decor is dominated by wood tones, with sturdy tables and chairs, wooden pews, and bare floors. Music is playing, quite loudly, but it's a good selection of tunes, and on a Saturday late-afternoon, the place is busy but not packed out, so tables are available. There's a large screen showing a rugby match, but the sound isn't on. On the bar are three handpulls, with Greene King IPA, Tribute and London Pride on a February 2010 visit, as well as draught taps for Leffe, Staropramen and other regulars. Thai food is served, as well as a Sunday lunch, though food wasn't sampled on our visit. Last visited by Ewan, Kat and others, 13 February 2010. Last edited 2013-05-10 06:57:01 (version 11; diff). List all versions. Page last edited 2013-05-10 06:57:01 (version 11).